· When World War I ended, Germany became a democratic republic that was known as the Weimar Republic. · The end of World War I began the economic crisis that the German government was unable to deal with. · In 1923, the Ruhr Valley, the heartland of the German industry, was occupied by the French. This was due to the fact that Germany was, and had been, unable to pay the war debts or reparations that had been set by the Treaty of Versailles. · The Chancellor or Prime Minister of the Weimar Republic succeeded in the task of getting France to withdraw from the Ruhr Valley, while America was loaning Germany money to help stabilize the German economy. · Between the years 1924 and 1929, the German economic situation briefly improved. Although the economic situation started to improve, Germany still remained politically and economically unstable throughout the 1920’s. 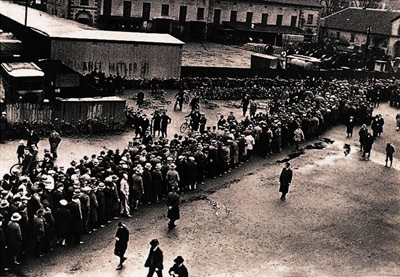 · The democracy that was the Weimar Republic could not, by any means, withstand the horrendous Great Depression that struck in 1929.